Boatbuilder Strategic Marine plans to expand its StratCAT range of crew transfer vessels to include two new 30m+ aluminium models, as demand for larger wind farm support craft, with increased technician-carrying capacity, gains pace. With design input provided by BMT Nigel Gee, the first of the new duo, the StratCAT 30, will be made available in three configurations, depending on whether the user wishes to deploy waterjets (the StratCAT 30 Quad WJ and StratCAT 30 XL Quad WJ) or Volvo Penta’s integrated propulsion system (IPS) (the StratCAT 30 IPS). 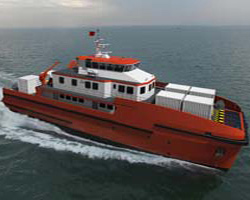 The configurations are intended to make it easier for operators to select a vessel that best reflects their operational requirements. For instance, the 30 XL Quad WJ has been designed to dedicate more of its space on the main deck to berths: it features the capacity for eight single berths, or four single and four double berths, compared to the 30 Quad WJ’s capacity for two single berths in this vessel area. This would suggest that the 30 XL Quad WJ is more suited to serving in a ‘floatel’-style capacity. The 30 Quad WJ, on the other hand, sacrifices the number of berths on the main deck for more overall space, enabling crew and technicians to walk around the vessel’s superstructure (which is not possible on the 30 XL Quad WJ) and granting it 100m² of cargo storage space on the forward deck, compared to the 30 XL Quad WJ’s 92m². The 30 Quad WJ can also transport up to 24 technicians, whereas the 30 XL Quad WJ is limited to 12, unless the operator wishes to remove two of the cabins. These differences aside, the three StratCAT 30 vessels share a number of common features. Each boat type’s cargo deck is strengthened to 2tonnes per m² and features a top deadweight of 40tonnes, and each vessel has the capacity to carry up to 40,000litres of fuel oil and 3,000litres of fresh water. The StratCAT 30’s extended length also enables this type to operate and conduct turbine technician transfers in larger wave heights than the majority of previously available 24-26m WFSVs. While those vessels could comfortably operate in wave heights of, say, 1.5-1.7m, the StratCAT 30 is able to extend this to 2.7m Hs for operations and 2.3m Hs for transfers, Strategic adds, thus widening the vessel’s operational window. Meanwhile, the StratCAT 38 (pictured above) extends the vessel concept’s length to just under 39m loa, whilst bumping up onboard capacities to 47,000litres of fuel, 5,200litres of water and 4,000litres of sewage. Cargo deck area and capacity is also increased to 165m² and a maximum deadweight of 60tonnes, enabling the carriage of up to 21tonnes of cargo, or six 10ft containers, between shore and wind farm. The StratCAT 38 will also feature the option for a Palfinger PK6500 deck crane and a secondary Palfinger PK50002 model, as well as a walk-to-work gangway for the technicians, the latter to be supplied by Norway’s Uptime. The vessel will enable transfers in the same significant wave heights as those possible with the StratCAT 30 range. The StratCAT 30 and 38 concepts have been approved by Lloyd’s Register, which has awarded them the notations 100A1 SSC and Catamaran workboat G3 MCH.